Line sequences in varied configurations create an illusion of dimension. Carey calls this Dimensionalization. Two dimensions can be perceived as three, and vice versa. On a two-dimensional space, a flat surface, many lines juxtaposed in varying distances at different points can be perceived as three-dimensional. In a three-dimensional space, following a similar concept, lines moving from the floor to the wall to the ceiling can appear to occupy space in mid-air from various vantage points, which creates a perceived topographical space, transforming the visualized landscape of an area. This dimensionalizing art compels you to look at a surface or a space differently, to contemplate your own perception and the environment around you. The goal is to navigate the line between what we see and what is, in hopes of better understanding the breadth of our visual perception. Darel Carey is a visual artist based in Los Angeles, California. He was born in Curaçao, and grew up in Colton, California. He served in the US Air Force as a language analyst, then separated in 2012 to pursue an art career, graduating from Otis College of Art and Design with a Bachelor of Fine Arts degree in 2016. 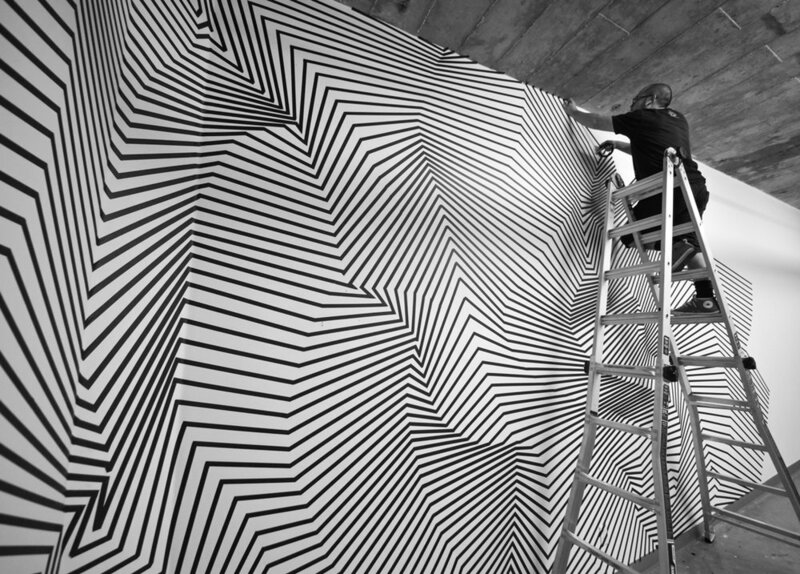 His current work includes abstract line drawings and optical tape installations. Visual and spatial perception are his main focus, using lines to shape and bend the perceived dimensions of a surface or a space. Darel has always had an affinity towards illusions and is fascinated by our visual understanding of the world around us. He is influenced by M.C. Escher in this regard. From tessellations to impossible geometric shapes and architecture, he enjoys the mathematical thinking involved in conceptualizing and contemplating such creations. Forming his line combinations organically, he appreciates the beauty of patterns found in nature, and attempts to embody these attributes in his art.